Høeg, Peter. 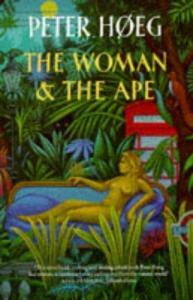 The Woman & the Ape. London: The Harvill Press, 1996. Madelene looked at the window frame, the park and, beyond that, across the city. From conversations overheard in her childhood home she had retained a vague and repulsive impression of what conditions were like for domestic animals on factory farms. She knew the meaning of such terms as spontaneous fracture, tongue rolling, somatotropin, urine drinking, manger biting, neighbour pecking and monotonization of mating behaviour. Now, in these terms, she spied herself. In truth it can’t be said that Høeg is particularly subtle about this – indeed the likenesses keep coming like a sledgehammer to the head – but it has a positive effect, and the continual reinforcement is likely intended. The saturation of simile and metaphor is relentless – not for one moment is the reader allowed to forget that before her is a cast of animals, a regular circus ring of them. The stage is set, and this ruthless undermining of our own puffed-up humanity – the humanity we perceive as somehow less animal in nature than the true animals – underlines the thread of masks and disguise that runs through the text. If, as a species, we can perceive ourselves as other than what we really are, how, as individuals, can we be expected to fare any better? Other masks, and more personal, inhabit our lives and define our identities. While science fiction does rely heavily on the theme of conformity and identity, seldom do the masks created within the genre reach this level of reality. The masks on show in The Woman & the Ape are not just constructs meant to deceive the self and others, they are characters in their own right. Each morning Madelene was resurrected. This resurrection occurred in front of her mirror and took between thirty and forty-five minutes. While it was underway, she was totally absorbed; during that space of time, with uncompromising thoroughness, she did the one thing she knew herself to be truly good at: she recreated the myth which said that Madelene looks gorgeous. Høeg’s description of the making of his protagonist’s mask as “resurrection” underlies this point. The mask is a living thing, with its own wants, needs, and expectations. The under-Madelene, the creative personality behind the mask, is content enough to exist, stupefied into near oblivion, behind the mask that she so industriously and continuously maintains. The bored trophy wife of a rich man, transplanted from her native Denmark into the teeming jungle of London, Madelene’s mask, her self-created myth, exists in her place until she comes face to face with a new form of ape. Illegally imported by her husband Adam, the ape Erasmus is as intelligent and human as Madelene herself – at least Madelene on her better days, when her brain is not pickled with alcohol. Recognising a kindred spirit, Madelene rescues Erasmus from her husband’s experiments, and the two of them flee through London, ending up in St. Francis Forest, a “pornographic Garden of Eden” within the city walls. Paradise does not last, of course. It never does. Adam is on their trail, and Erasmus is not the only ape around… and he and his kind are getting just a bit fed up with humanity. Slowly Madelene finds that the self she had constructed, the self that she resurrects every day, is insufficient for this new life. Its use as a tool is too limited. Adequate for her previous life, its careful incompetence, cultivated expectations, and determined conformity is wholly unsuited for the present. To begin with she persuaded herself – half in anger, half in panic – that the animal was retarded or at any rate that its language skills were at too low a level for it to understand all the cunning little ways in which human lovers are forever reassuring one another…. after a day or two it dawned on her that this was not because Erasmus could not. It was just that it never occurred to him. And what was more she did not want it either. Madelene can no longer hide behind a facade of irresponsibility, any more than Adam can maintain a gentleman’s exterior to the public and simultaneously engage in smuggling and illegal experiments within the shady underbelly of London’s zoological community. New masks, new identities, are required for her to navigate through this new world. Yet this relatively straightforward uncovering of character within a protagonist is not terribly surprising in any book, any genre. What makes this theme stand out so here is not the uncovering itself, but the thoroughness of the masks presented, their ubiquity throughout the text, and the horrible fact that even these new, superior apes – so much more admirable than Homo sapiens sapiens! – are working with masks of their own. Erasmus may be attractive for his emotional honesty – such a contrast to Madelene’s training in the bribery of love – but his people are not so different from ours. It’s possible that the true sting in the tale of this evolutionary fable is not the abandonment of humanity by Erasmus and his kin. In one form or another, this leave-taking is a relatively common science fiction trope. However, the frantic response of the public to the unmasking – the sheer emotionalism of it – is further proof that the masks of The Woman & the Ape are characters in their own right. They could not be certain of the identity of their bosses, or their friends. They eyed one another fearfully, tried to remember how their children and their spouses looked naked, wondered when exactly they had first met their wives, frantically they wondered whether she might be an ape, or the daughter of an ape. This reaction can be partially ascribed to the social stigma of having an ape in the family, of course (Wilberforce is never truly gone! ), but this misses the wider implication. The unmasking is a betrayal, an abandonment. Entire relationships are shown to be founded on a lie; deceptions from the beginning. The husband of the RZS vice-president has been used and thrown over, his emotions vivisected as thoroughly as Erasmus would have been vivisected biologically. The boundaries between the natural and the unnatural, between love and duty, between human and ape, have again been blurred. In the end, we are all responsible for our masks. They take a deal of construction, a continual resurrection. If we are careful, and clever, the masks we show to the world are indistinguishable from a true face. And if others believe that mask to be real, are we not responsible for them falling into the lie that we have so carefully and cleverly created? The grieving husband loved something that did not exist – but he loved. Can one say the same for his wife? And on their separate islands, separated by space and species, what faces will these two see when they look in the mirror? Who knows. But as apes ourselves, we know what it is like to look into a mirror and see the masks that we’ve made… masks that are more real to us than our true natures. Unaccountably (to me at least) The Woman & the Ape was not positively received by critics, who may have been expecting something more along the lines of Miss Smilla’s Feeling for Snow. Høeg’s extremely eclectic style, changing from book to book, is a warning against any such assumption. Personally, despite that reception, I can only say that after The Woman and the Ape, I am sure that, decades in the future, if Høeg keeps writing and doesn’t get hit by a bus, the Nobel Prize for Literature is coming his way.